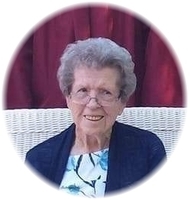 Provide comfort for the family of Evelyn Chenoweth with a meaningful gesture of sympathy. Memorial services will be held 12:00 PM, Friday, February 8, 2019 at Southmoore Baptist Church, 3801 S. Broadway, Moore, Oklahoma 73160. Evelyn Isabell Wagner was born March 25, 1926 in Duncan, OK to Cecil and Stella Wagner. She was born again into God’s Kingdom at the age of eleven when she accepted Christ as her Lord and Savior. She spent the rest of her life living for Him and sharing her faith with everyone who met her. Her early years were spent in Faxon and Oklahoma City, but later lived in Roswell, NM where she met and married the love of her life, Arthur Lee Chenoweth on November 30, 1944. They moved back to Oklahoma City where they raised their family of four children. Evelyn joined Wilmont Place Baptist Church in 1950 where she served in various capacities until age and poor health required her to give up the physical tasks that she so loved. However, her love for her Lord and her church never waned. She prayed for her church, her pastor, her family members, and all those who touched her life right to the end of her time on earth. Her dearest hope was to lead others to faith in Christ and to teach and train them in the love of the Lord. She raised her children and taught her grandchildren to seek and follow God’s will—to love Him and serve Him. This was the theme of her life. She never wavered in her stubborn and persistent goal of following Christ. In recent days her grandchildren have posted tributes to a Grandma that was much loved, expressing their thanks for her endless supply of hugs, for her Bed & Breakfast that was always open to them, the lessons she taught them and the awful but oh-so-loved lullabies she would sing. They remembered that she would open her door, her heart and her Bible to anyone. It was said that she could cook a meal from scratch and quote scripture simultaneously. They remembered that Bedlam was always fun to watch together as a family because she was cheering no matter which way the ball went. One granddaughter remembered that on the day of Granddad Chenoweth’s funeral she got up early and made homemade biscuits for breakfast—because always putting her family and others first was second nature to her. But she also enjoyed other pursuits such as baking wonderful cakes and her specialty—hot rolls—lovingly known by her family as “grandma’s buns”! Evelyn learned to paint and has left many examples of oils, water colors, and tole, or Pennsylvania Dutch, boxes and plaques. She was an avid gardener and loved working in her yard creating many landscapes and lily ponds, which she would dig up and move when it didn’t please her “esthetically”. She had a passionate pursuit of tracing the lineage of the Chenoweth, Wagner, Cook and MacFatridge families with all research being done prior to the on-line technology available today. She spent many hours in libraries and cemeteries, on the phone, and traveling to other states to gather information for the volumes of family history she pieced together. She worked as a bookkeeper at Montgomery Ward and Crane Plumbing Co. in the 60’s and 70’s, and for a brief time served as church secretary at Wilmont Place Baptist Church. and two brothers, W.J. and Cecil Wagner. two sisters: Lavella Shaw of Kansas City, MO, and Bernice Overman of Rocky Point, NC. and 4 great-great grandchildren, all of whom were very special to her, and many loving nieces, nephews, cousins and several others who still call her “mom” or “grandma”. To send flowers in memory of Evelyn Isabell Chenoweth (Wagner), please visit our Heartfelt Sympathies Store. There will be a Memorial service at 12:00 PM Friday, February 8, 2019 at Southmoore Baptist Church 3801 S. Broadway Moore, Oklahoma 73160. The funeral home is not involved in the service so please have all floral arrangements delivered directly to the church. Provide comfort for the family of Evelyn Isabell Chenoweth (Wagner) by sending flowers. May your family find comfort as “the hearer of prayer” embraces their heart (Psalms 94:19). Lean on one another for strength and encouragement to stay strong. We hope that the many hugs, kind words, cherished memories, and loving prayers sustains your family during this most difficult time. John 5:28,29.